Players need to be version 5.0 or higher to use this feature. WARNING: Once a game account has been linked with a Game Center account it cannot be removed! Before logging into the game, go to Game Center under Settings and sign into your account there. You will be prompted to do this later in the process if not done initially. Once signed into Game Center, open the game. You will be prompted to either “Link to Game Center” or “Continue” without linking. If you choose to “Continue” without linking, you will be able to link your account later. 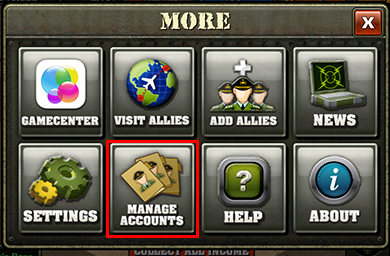 To link your device, go to the in-game Menu > More > Manage Accounts. There you will be asked to link your device. It will give you two options: “Link iOS Device” and “Link Different Device”. Select “Link iOS Device”. If you are just getting this set up for the future you can stop here. You can link multiple iOS game accounts by signing into the same Game Center profile and linking each game account using the steps above. This will allow you to sync between any of your game accounts whenever you want. To sync to a different device, sign into Game Center, then open the game. 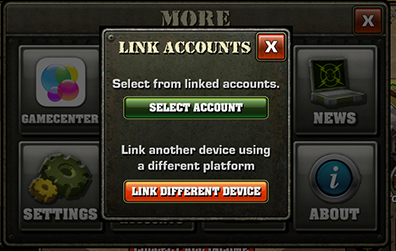 If a new device, use the steps above to link the new account to your Game Center account. You need the account currently on the device to be linked to Game Center to begin the sync process. Go to the in-game Menu > More > Manage Accounts. You should see two buttons; “Select Accounts” and “Link Different Device”. Select “Select Accounts” to bring up the Account Selection popup. You should now see any of the accounts you have linked to your Game Center profile. Now simply select the account you wish to play on. 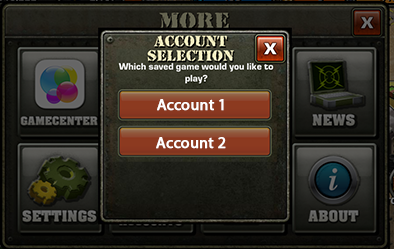 After selecting the account you wish to play on, you will be prompted to restart the game. Close the game completely and reopen it. You should now have the selected account on your device!